This is a logic puzzle for 5th grade students in Singapore, originally posted by Kennethjianwen in Facebook. One of my friends re-post the picture and it appeared in my news feed and it got my attention. Bernard: At first, I don’t know when Cheryl’s birthday is, but I know now. Question: so when is Cheryl’s birthday? This is a fairly simple logic question. There is no multiple possible answers here. Only one definite answer: 16 July. This answer has 100% certainty, it can be logically deducted from the hints given by Albert and Bernard. 1. Let’s re-state the facts here. Albert knows the MONTH of Cheryl’s birthday and Bernard knows the DAY. They don’t know the other piece of information, but they both share one common knowledge: the 10 possible dates given by Cheryl. 2. 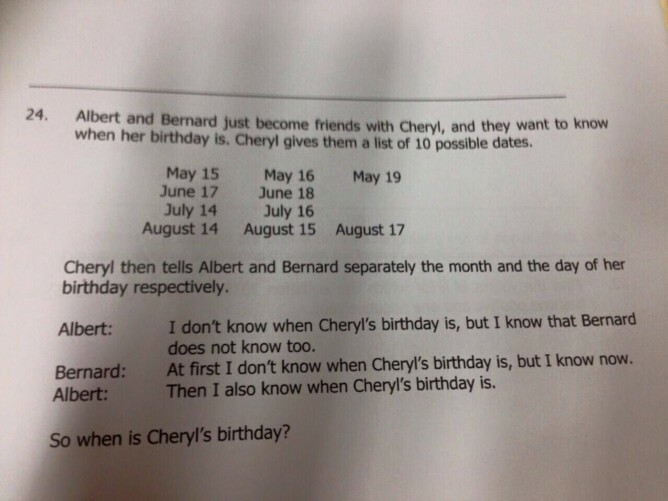 In hint 1, Albert says that he knows that Bernard does not know Cheryl’s birthday after knowing the day from Cheryl. Notice that IF Cheryl’s birthday is 18 June or 19 May, then Bernard would have immediately know the entire birthday just by knowing the day. This is obviously not the case because Albert is sure that Bernard does not know. So we can safely remove 18 June and 19 May from the possibilities. 3. Now, how does Albert knows that Bernard was not told “18” or “19”? Simple. Because Albert knows the month from Cheryl and it’s not May or June. So we can conclude that Cheryl’s birthday month is either July or August. So far we have removed 15 May, 16 May, 19 May, 17 June and 18 June just by using the first hint from Albert. 4. Next, we use the second hint. Bernard says that he previously didn’t know Cheryl’s birthday, but after hearing Albert’s hint, now he knows exactly when Cheryl’s birthday is. Since Albert’s first hint helped us to removed all possible dates from May and June, it also helps Bernard. If the day given to Bernard is 14, Bernard would still have question whether Cheryl’s birthday is 14 July or 14 August. But Bernard doesn’t have this question. He knows Cheryl’s birthday after he realises that the month that Albert knows is either July or August, we can safely remove 14 July and 14 August from the possible dates. 5. At this point, we know that Bernard already knows the exact date, but we are still wondering whether it is 16 July, 15 August or 17 August. Bernard knows the date so he quickly knows. We don’t. So how do we know? We use the third hint. After hearing that Bernard now knows the date, Albert also says that he knows the date. If the month that Albert knows is August, he would not say that because he would be wondering between 15 August and 17 August. But Albert knows Cheryl’s birthday. This is only possible if the date that Cheryl told Albert was July. 6. We already removed 14 July from the list. So the only date left is 16 July. Cheryl’s birthday is 16 July. The deduction A above should be clear enough to follow. But in case you are still confused, let me present deduction B with complete set of possibilities. 1. If the birthday is 15 May, then Albert would not know that Bernard knows Cheryl’s birthday or not. Because if Albert is told “May”, then Bernard may or may not know Cheryl’s birthday, depending whether Cheryl told Bernard “15”, “16” or “19”. If Cheryl told Bernard “15” or “16”, Bernard would not know her birthday, but if she told him “19”, Bernard would know. Albert knows that Bernard definitely would not know Cheryl’s birthday from knowing the day, so 15 May is not the answer. 2. If the birthday is 16 May, then Albert would not know that Bernard knows Cheryl’s birthday or not. Because if Albert is told “May”, then Bernard may or may not know Cheryl’s birthday, depending whether Cheryl told Bernard “15”, “16” or “19”. If Cheryl told Bernard “15” or “16”, Bernard would not know her birthday, but if she told him “19”, Bernard would know. Albert knows that Bernard definitely would not know Cheryl’s birthday from knowing the day, so 16 May is not the answer. 3. If the birthday is 19 May, then Albert would not know that Bernard knows Cheryl’s birthday or not. Because if Albert is told “May”, then Bernard may or may not know Cheryl’s birthday, depending whether Cheryl told Bernard “15”, “16” or “19”. If Cheryl told Bernard “15” or “16”, Bernard would not know her birthday, but if she told him “19”, Bernard would know. Albert knows that Bernard definitely would not know Cheryl’s birthday from knowing the day, plus Bernard admits that he initially didn’t know, so 19 May is not the answer. 4. If the birthday is 17 June, then Albert would not know that Bernard knows Cheryl’s birthday or not. Because if Albert is told “June”, then Bernard may or may not know Cheryl’s birthday, depending whether Cheryl told Bernard “17” or “18”. If Cheryl told Bernard “17”, Bernard would not know her birthday, but if she told him “18”, Bernard would know. Albert knows that Bernard definitely would not know Cheryl’s birthday from knowing the day, so 17 June is not the answer. 5. If the birthday is 18 June, then Albert would not know that Bernard knows Cheryl’s birthday or not. Because if Albert is told “June”, then Bernard may or may not know Cheryl’s birthday, depending whether Cheryl told Bernard “17” or “18”. If Cheryl told Bernard “17”, Bernard would not know her birthday, but if she told him “18”, Bernard would know. Albert knows that Bernard definitely would not know Cheryl’s birthday from knowing the day, plus Bernard admits that he initially didn’t know, so 18 June is not the answer. 6. If the birthday is 14 July, then Albert would know that Bernard would not know Cheryl’s birthday. Because if Albert is told “July”, then Cheryl could told Bernard “14” or “16”. None of these numbers would give any certainty to Bernard to know Cheryl’s birthday without further clue. Albert knows that Bernard definitely would not know Cheryl’s birthday from knowing the day, so 14 July could be the answer. Let’s analyse further. After hearing the first hint from Albert, Bernard now knows Chery’s birthday. If the number given to Bernard was “14”, Albert’s hint is NOT enough for Bernard to make a conclusion because he still have two possible dates: 14 July or 14 August. So 14 July is not the answer. 7. If the birthday is 14 August, then Albert would know that Bernard would not know Cheryl’s birthday. Because if Albert is told “July”, then Cheryl could told Bernard “14” or “16”. None of these numbers would give any certainty to Bernard to know Cheryl’s birthday without further clue. Albert knows that Bernard definitely would not know Cheryl’s birthday from knowing the day, so 14 August could be the answer. Let’s analyse further. After hearing the first hint from Albert, Bernard now knows Chery’s birthday. If the number given to Bernard was “14”, Albert’s hint is NOT enough for Bernard to make a conclusion because he still have two possible dates: 14 July or 14 August. So 14 August is not the answer. 8. If the birthday is 15 August, then Albert would know that Bernard would not know Cheryl’s birthday. Because if Albert is told “August”, then Cheryl could told Bernard “14”, “15” or “17”. None of these numbers would give any certainty to Bernard to know Cheryl’s birthday without further clue. Albert knows that Bernard definitely would not know Cheryl’s birthday from knowing the day, so 15 August could be the answer. Let’s analyse further. After hearing the first hint from Albert, Bernard now knows Chery’s birthday. If the number given to Bernard was “15”, Albert’s hint is enough for Bernard to make a conclusion. However, if this is the case, after hearing that Bernard knows Cheryl’s birthday, Albert would still not know her birthday because Albert only knows the month “August” and he still has two possible dates: 15 August or 17 August. Since in hint #3 Albert says that he now knows Chery’s birthday, so 15 August is not the answer. 9. If the birthday is 17 August, then Albert would know that Bernard would not know Cheryl’s birthday. Because if Albert is told “August”, then Cheryl could told Bernard “14”, “15” or “17”. None of these numbers would give any certainty to Bernard to know Cheryl’s birthday without further clue. Albert knows that Bernard definitely would not know Cheryl’s birthday from knowing the day, so 17 August could be the answer. Let’s analyse further. After hearing the first hint from Albert, Bernard now knows Chery’s birthday. If the number given to Bernard was “17”, Albert’s hint is enough for Bernard to make a conclusion. However, if this is the case, after hearing that Bernard knows Cheryl’s birthday, Albert would still not know her birthday because Albert only knows the month “August” and he still has two possible dates: 15 August or 17 August. Since in hint #3 Albert says that he now knows Chery’s birthday, so 17 August is not the answer. 10. If the birthday is 16 July, then Albert would know that Bernard would not know Cheryl’s birthday. Because if Albert is told “July”, then Cheryl could told Bernard “14” or “16”. None of these numbers would give any certainty to Bernard to know Cheryl’s birthday without further clue. Albert knows that Bernard definitely would not know Cheryl’s birthday from knowing the day, so 16 July could be the answer. Let’s analyse further. After hearing the first hint from Albert, Bernard now knows Chery’s birthday. If the number given to Bernard was “16”, Albert’s hint is enough for Bernard to make a conclusion. If this is the case, after hearing that Bernard knows Cheryl’s birthday, Albert would know her birthday because Albert knows the month “July” and there is only one possible date left for July. Since in hint #3 Albert says that he now knows Chery’s birthday, so 16 July is the answer. Edit: Some sources claim that the news about this question being given to 5th grade students is not correct. Still an interesting puzzle though. There is more than one answer..
if her BD was june 17… the same argument wouls stand true.. Your explanation in A3 is not ok. The first sentence is useless since the question ‘how does Albert know that Bernard was not told “18” or “19”?’ has already been answered in A2 (18 and 19 are unique dates). In the next sentence you answer that question with “Because Albert knows the month from Cheryl and it’s not May or June.” The second half of that answer is a deduction but an assumption. Why is it not May or June? Because Albert knows? Albert’s knowledge of the month can, for us, not mean that it is not May or June. Would be nice if you could fill that hole in your otherwise good explanation. 1. I don’t know whether Bernard knows the birthday or not. 2. I know that Bernard does not know. If Bernard is given the date 15 or 16 then Bernard does not know Cheryl’s birthday. But if he is given the day 19, he would immediately knows. Therefore, if Albert is given the month May, he won’t be able to tell whether Bernard is given the date 15, 16, or 19. Hence, Albert does not know whether Bernard knows the birthday or not. If Albert is given the month “May”, he MUST choose to say statement 1. But Albert’s first hint is statement 2, so the month he knows is NOT May. Same logic for eliminating June. Thank you Robert, Could I put it in this way? 1. If Albert is told “May”, then we can say that Bernard is told “15” or “16” or “19” to get the birthday, then Albert is NOT sure whether Bernard knows or not. (If Bernard is told “15” or “16”, Bernard doesn’t know, if “19”, Bernard knows.) But Albert IS SURE that Bernard doesn’t know. So “May” is not told. 2. If Albert is told “June”, then we can say that Bernard is told “17” or “18” to get the birthday, then Albert is NOT sure whether Bernard knows or not. (If Bernard is told “17”, Bernard doesn’t know, if “18”, Bernard knows.) But Albert IS SURE that Bernard doesn’t know. So “June” is not told. 3. If Albert is told “July”, then we can say that Bernard is told “14” or “16” to get the birthday, then Albert IS SURE that Bernard doesn’t know and he says “but I know that Bernard does not know too.”. So “July” is possible. 4. If Albert is told “August”, then we can say that Bernard is told “14” or “15” or “16” to get the birthday, then Albert IS SURE that Bernard doesn’t know and he says “but I know that Bernard does not know too.”. So “August” is possible. 5.Can Albert says the birthday now? No, he can have “July”, which means “July 14” or “July 16”, or he can have “August”, which means “August 14” or “August 15” or “August 16”. Too many choices. 6. Bernard hears what Albert says. He is told a number to choose an exact date in “July” and “August”. Can the number be “14”? No, because Bernard can’t choose from “July 14” and “August 14”. Can the number be “15” or “16” or “17”? Yes, everyone will be possible. Can Bernard says the birthday now? Yes. Finally Albert and Bernard know that the birthday is “July 16”. On point 5 Deduction A, there is a slight problem after eliminating to July 16, August 15 and August 17. Why would Albert know which day Bernard is choosing? We are skipping one step where Albert is able to correctly deduce the date. It is a random guess from the point-of-view of Albert as he would know that Bernard has 3 choices. Since those 3 date are unique + Bernard has the digits, it could be anyone of the three. This would mean that the 3rd statement by Albert is a guess, because he does not know what Bernard has. Albert does NOT initially know which day Cheryl told Bernard. Remember that Bernard and Albert are NOT choosing anything here. They both receive the piece of information from Cheryl, not choosing whatever they like. On point 5, the only reason Albert can make a conclusion on the birthday is because he also holds one piece of information: the month. IF Albert is given the month August. He won’t be able to tell whether the day given to Bernard is 15 or 17. But Albert says he knows now. It’s not a guess. It’s based on the month he knows. Therefore the month Cheryl told Albert is not August. It only leaves us with one possible month: July. And how do you know that? It’s not a fact, not told in description. IF Albert knows the DAY and Bernard the MONTH, then the answer would be 17.6. Both answers are right.